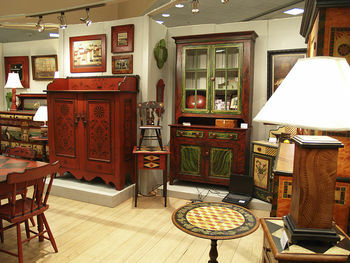 Dan and Marlene Coble have been creating paintings, one-of-a-kind painted furniture and accessories for over 40 years. We use antique, quality vintage, and newly built furniture as the "canvas" for our paint decoration. Our styles are inspired by the rich traditions of paint decoration in America and include grain painting, stencil decoration and free-hand painting. We also offer prints from our original artwork. Painted furniture is divided into three basic categories, grained, freehand painted and stenciled. Sometimes combinations of these techniques are used. Graining is a type of paint decoration intended to simulate exotic wood grains like mahogany, tiger maple, and rosewood. Dry pigments, suspended in a solution of oil or vinegar, are applied over a base color, usually yellow or red. Using different materials, such as feathers, rags, brushes, combs etc. 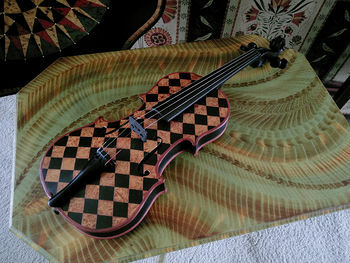 a variety of textures and patterns are created. Freehand painting is a type of decoration where the paint is applied with a brush directly to a surface, without the aid of a pattern. Painted tin ware is an example of freehand decoration using stylized brush strokes. Early furniture decorated with freehand painting reflects the regions where it was created. Blanket chests and armoires are typical pieces that might have been decorated with freehand paint motifs. Stencil decoration utilizes a stylized design cut from paper or acetate. The stencil is laid over the area that is to be decorated. Paint or bronzing powders are "brushed" through the open areas of the stencil, creating the design. "Hitchcock" chairs are well known examples of furniture using stencil decoration. Theorem painters also used stencil technique.